Providence's James Walker was dynamite against Marquette in the NIT, connecting on 12 field goals, 12 foul shots and tallying 36 points, all record for a MU opponent in an NIT game. Providence also sank 32 field goals as a team, which is a high mark for a MU opponent in the NIT. 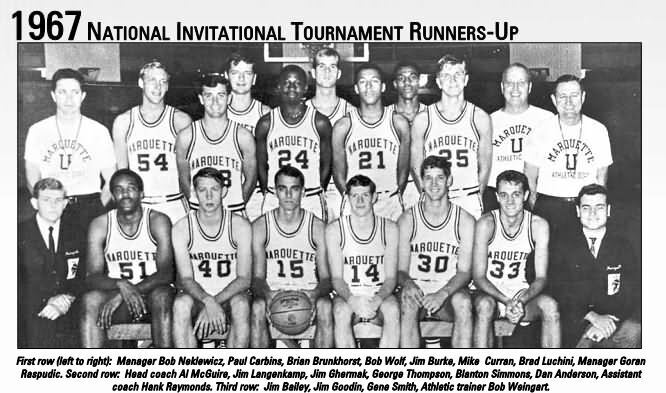 Bob Wolf knocked down 10 foul shots for Marquette (MU NIT record) and the Warriors pulled one out in overtime on March 14th, against their future Big East foe.